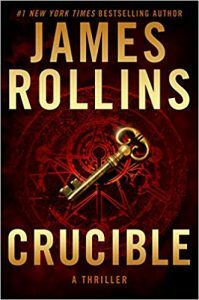 The Bottom Line: You never expect the Spanish Inquisition, but leave it to James Rollins to create a complex action/fantasy thriller that actually entertains and (mostly) makes sense. James Rollins’ reliable Sigma Force series may be in its 13th installment, but that doesn’t mean his luck has turned. On the contrary, this may be a perfect entry point for newcomers to get in on the fun. What Pierce learns from Kat sets Sigma Force on a frantic quest for answers that are connected to mysteries reaching back to the Spanish Inquisition and to one of the most reviled and blood-soaked books in human history — a Medieval text known as the Malleus Maleficarum, the Hammer of Witches. What they uncover hidden deep in the past will reveal a frightening truth in the present and a future on the brink of annihilation, and force them to confront the ultimate question: What does it mean to have a soul? While there’s plenty of Rollins’ trademark history and theoretical science to digest, there’s also a healthy dose of fantasy. Just roll with the over-the-top storyline and enjoy. Perfect for Dan Brown fans waiting for the next Professor Langdon series novel.